1 Hearty Welcome to. 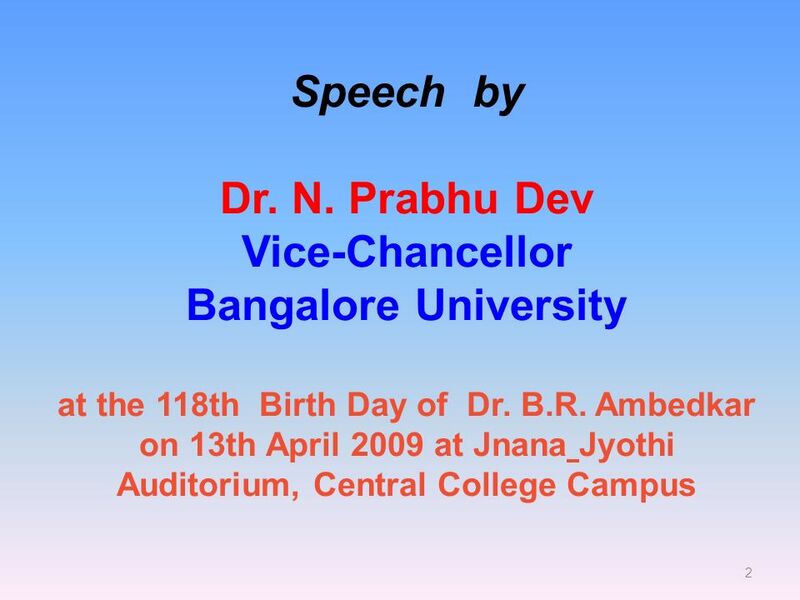 2 Speech by Dr. N. Prabhu Dev Vice-Chancellor Bangalore University at the 118th Birth Day of Dr. B.R. Ambedkar on 13th April 2009. 4 4 Bhimrao Ramji Ambedkar also known as Babasaheb, was an Indian nationalist, jurist, Dalitv political leader and a Buddhist revivalist. He was also the chief architect of the Indian Constitution. 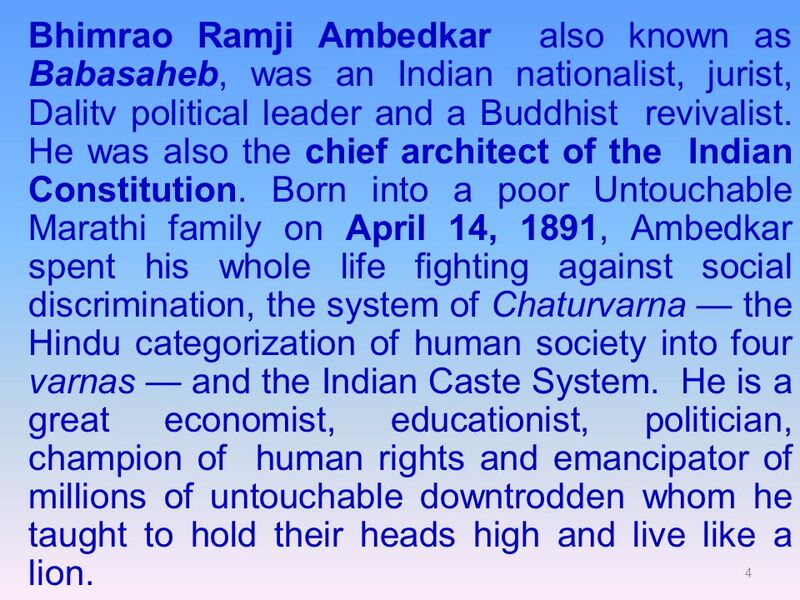 Born into a poor Untouchable Marathi family on April 14, 1891, Ambedkar spent his whole life fighting against social discrimination, the system of Chaturvarna the Hindu categorization of human society into four varnas and the Indian Caste System. He is a great economist, educationist, politician, champion of human rights and emancipator of millions of untouchable downtrodden whom he taught to hold their heads high and live like a lion. 5 5 Overcoming numerous social and financial obstacles, Ambedkar became one of the first "untouchables" to obtain a college education in India. 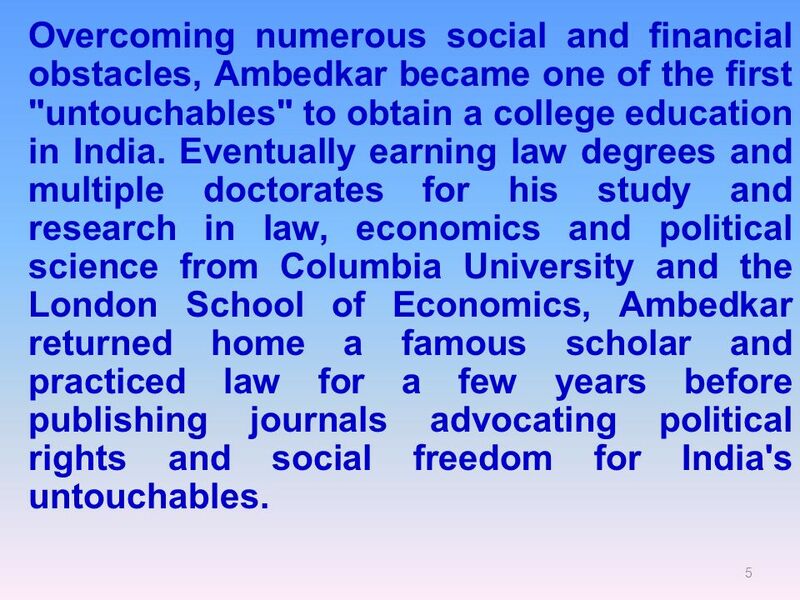 Eventually earning law degrees and multiple doctorates for his study and research in law, economics and political science from Columbia University and the London School of Economics, Ambedkar returned home a famous scholar and practiced law for a few years before publishing journals advocating political rights and social freedom for India's untouchables. 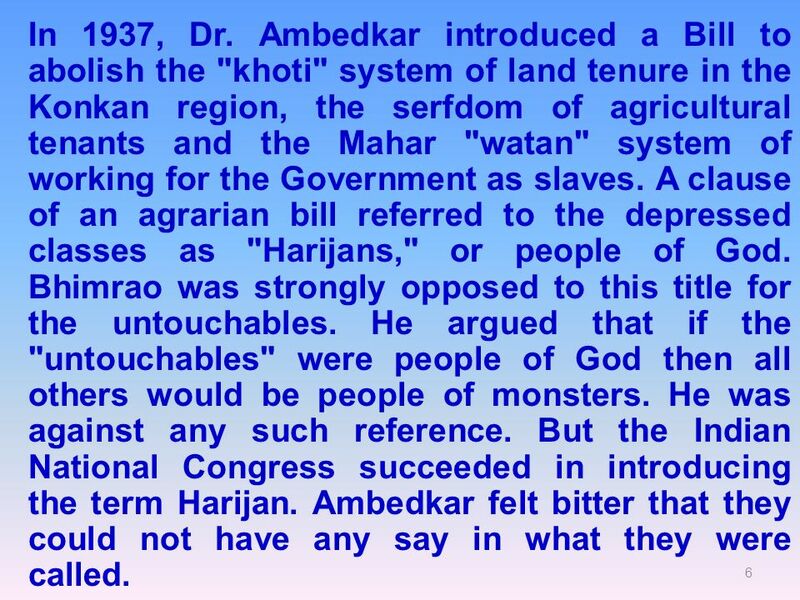 6 6 In 1937, Dr. Ambedkar introduced a Bill to abolish the "khoti" system of land tenure in the Konkan region, the serfdom of agricultural tenants and the Mahar "watan" system of working for the Government as slaves. A clause of an agrarian bill referred to the depressed classes as "Harijans," or people of God. Bhimrao was strongly opposed to this title for the untouchables. He argued that if the "untouchables" were people of God then all others would be people of monsters. He was against any such reference. But the Indian National Congress succeeded in introducing the term Harijan. Ambedkar felt bitter that they could not have any say in what they were called. 7 7 In 1947, when India became independent, the first Prime Minister Pt. Jawaharlal Nehru, invited Dr. Bhimrao Ambedkar, who had been elected as a Member of the Constituent Assembly from Bengal, to join his Cabinet as a Law Minister. He was the first Law Minister of India; conferred Bharat Ratna in 1990. 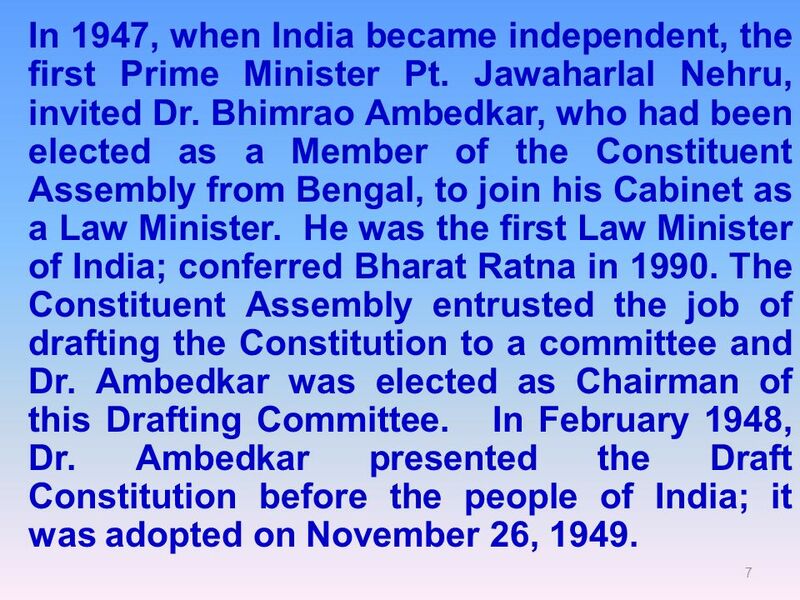 The Constituent Assembly entrusted the job of drafting the Constitution to a committee and Dr. Ambedkar was elected as Chairman of this Drafting Committee. In February 1948, Dr. Ambedkar presented the Draft Constitution before the people of India; it was adopted on November 26, 1949. 8 8 In October 1948, Dr. Ambedkar submitted the Hindu Code Bill to the Constituent Assembly in an attempt to codify the Hindu law. The Bill caused great divisions even in the Congress party. Consideration for the bill was postponed to September 1951. When the Bill was taken up it was truncated. A dejected Ambedkar relinquished his position as Law Minister. On May 24, 1956, on the occasion of Buddha Jayanti, he declared in Bombay, that he would adopt Buddhism in October. On 0ctober 14, 1956 he embraced Buddhism along with many of his followers. On December 6, 1956, Baba Saheb Dr. B.R. 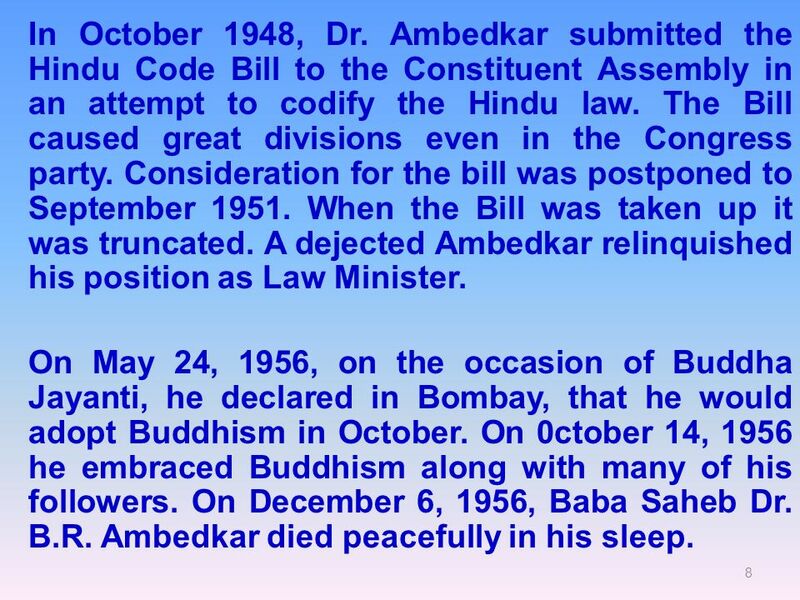 Ambedkar died peacefully in his sleep. 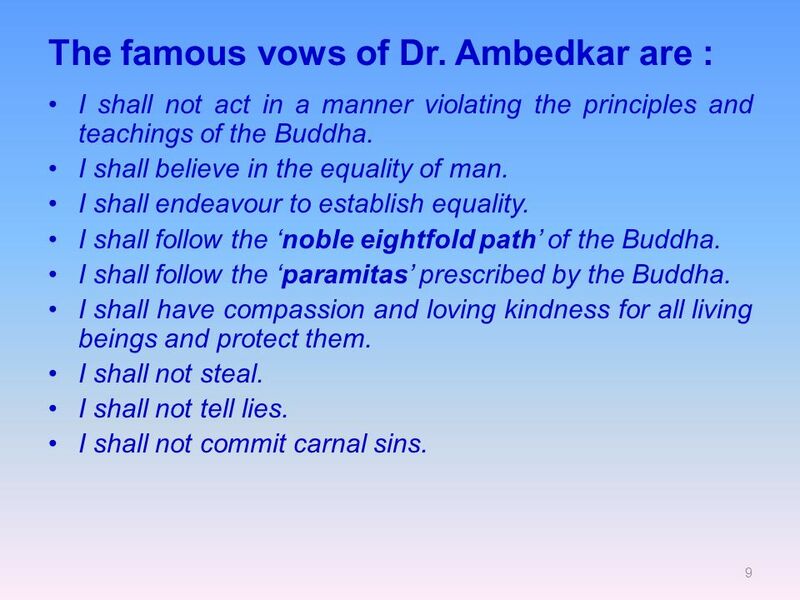 9 9 The famous vows of Dr. Ambedkar are : I shall not act in a manner violating the principles and teachings of the Buddha. I shall believe in the equality of man. I shall endeavour to establish equality. I shall follow the noble eightfold path of the Buddha. I shall follow the paramitas prescribed by the Buddha. I shall have compassion and loving kindness for all living beings and protect them. I shall not steal. I shall not tell lies. I shall not commit carnal sins. 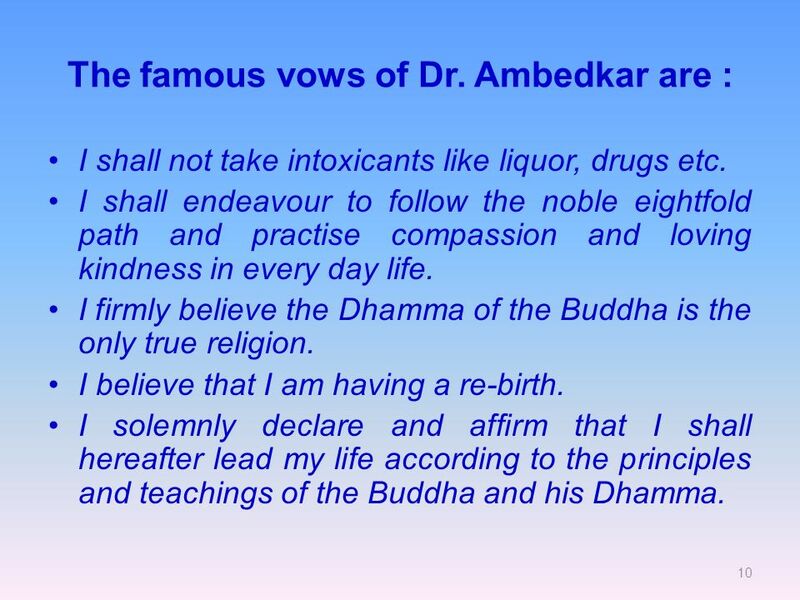 10 10 The famous vows of Dr. Ambedkar are : I shall not take intoxicants like liquor, drugs etc. I shall endeavour to follow the noble eightfold path and practise compassion and loving kindness in every day life. I firmly believe the Dhamma of the Buddha is the only true religion. I believe that I am having a re-birth. I solemnly declare and affirm that I shall hereafter lead my life according to the principles and teachings of the Buddha and his Dhamma. Download ppt "1 Hearty Welcome to. 2 Speech by Dr. N. Prabhu Dev Vice-Chancellor Bangalore University at the 118th Birth Day of Dr. B.R. Ambedkar on 13th April 2009." THIS IS With Hosts... Your Geography Culture and Today Vocab Which country am I? ReligionsGrab Bag World Cultures Review. Origins of Buddhism Lesson 3. India’s Society and Social Relations November 1, 2010.  Born on 25th Dec 1876  Died on September  Also known as Baba-e-Quam. Independence for India. The Growth of Nationalism What factors under British rule contributed to a growing nationalist feeling in India? What factors. South Asia. Monsoon Seasonal winds that bring rain in the summer Necessary to water crops Too much= flooding Too little=drought and crop failure. Explore the life journey of Siddhartha Gautama. Explore the teachings of Buddha and Buddhism. Identify the Four Noble Truths and the Eightfold Path to. Why did Buddhism appeal to many people in various parts of Asia? Constitution and Coming of Democracy.  The 1861 Council of India Act  Nehru Committee of 1928 and the Demand for Dominion Status  Communal Award of. Unit 2— Africa’s Nationalist & Independence Movements! Universal Declaration of Human Rights The origins. REPORT ON STUDY TOUR TO INDIA COMMISSION ON REVENUE ALLOCATION Promoting an equitable society 17 TH DECEMBER 2012. Buddhism. ☸ Siddhartha Gautama, the founder of Buddhism, was born a prince in 563 BCE into a wealthy high caste family. ☸ He lived a sheltered life, never. Enlightenment Text pages World History Standard 13- Examine the intellectual, political, social, and economic factors that changed the world view. MAYOOR SCHOOL, AJMER April 14, Dr. Bhimrao Ambedkar April 14, 1891 – December 6, 1956. India. India: Thinking back What do you remember about India from what we learned before Christmas Break? Write it down in your notes..